The stop is located at: ‘Koningin Astridplein’ in front of the Quick restaurant and nearby the Central Station. A lot of important hotels are located in the area. 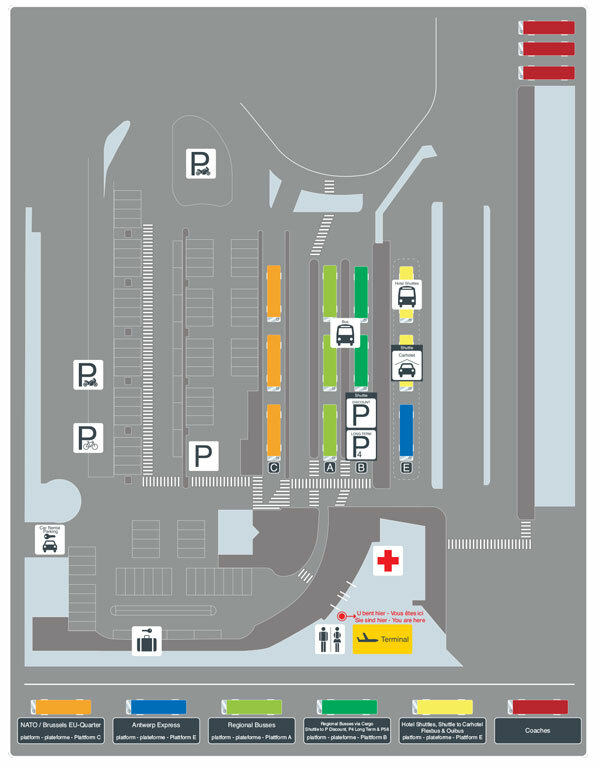 Park & Ride in immediate vicinity of bus stop or at 50 meters below the train station. Entrance via the Carnotstraat or Gemeentestraat Parking. Stop at the Crowne Plaza Hotel, G. Le Grellelaan, ideal location for the users of this bus line who need parking or Park & Ride facilities. The (unguarded) parking is free of charge. Level 0 | Follow the signs and Antwerp Express in the airport terminal. We drive our passengers safely, punctually and comfortably to their destination. *departing or arriving passengers and their accompanying persons from or to Brussels Airport. *staff employed at Brussels Airport. By purchasing a ticket, the passenger accepts our general terms and conditions for transport. The driver hast the right at all times to ask for an airport badge or other proof of employment at the airport, boarding pass, airline ticket or similar travel document. The general terms and conditions for transport are affixed in the vehicle. * The departure and driving times are indicative and subject to change.